We’ll use an offline OpenCL™ compiler to compile the “BitonicSort” OpenCL kernel (from the AMD APP SDK) into a standard HSA code object (“hsaco”) format. The actual dispatch will use the low-level HSA Runtime calls. Recall that ROCR is an implementation of the HSA Runtime with extensions for multi-GPU configurations. We’ll show you how to extract HSA queue and agent structures from the HCC C++ ones, and then use them to perform the kernel launch. There are several reasons you might want to do something along these lines. First, many kernels exist in OpenCL and re-using this existing investment can save time. The OpenCL kernel language is widely-used, and it enables programmers to use advanced GPU features including local memory, rich math functions, and vector operations. But the OpenCL runtime can be verbose and the memory interface can be difficult to control and optimize. HCC provides the advantage of a full C++ runtime but also full control over the memory allocation and copies. Using the techniques we’ll show you here, you can employ OpenCL kernels without having to port the host runtime code to OpenCL. This approach offers a significant advantage for larger C++ programs that can use a few optimized OpenCL kernels while sticking with C++ kernels and features for the rest of the program. Hsaco is informally pronounced “sock-o” (with a slight emphasis on the first letter to reflect the otherwise silent “h”). It’s a standard ELF file ; ELF (“Executable and Linkable Format”) is a container format widely used in Linux to store object code, and the hsaco ELF container organization matches the one generated by the popular LLVM tool chain. Hsaco stores the compiled GCN code in the .text section, it optionally contains debug information, and it defines symbols that allow the host code to find the kernel entrypoints and functions. Like other ELF files, code objects can contain multiple kernels, functions, and data – so when using hsaco you will need to specify both the code object and the desired symbol. Refer to the detailed description of the hsaco format for more information. Many tools in AMD’s compiler chain generate and use the hsaco format including OpenCL, HCC, HIP, the GCN assembler and the HSAIL Finalizer. Kernel code contained in hsaco can be extracted and then launched onto the GPU. Additionally, the dissembler tool can disassemble hsaco files so you can see what is going on inside the kernel. In a future blog, we’ll talk about using the same techniques described here to assemble and then launch kernels written in GCN assembly. Essentially, hsaco is the interchange format used to pass code between these different tools, and allows code written in different languages to be used together. Use a separate file and load it using C++ file I/O code. See the load_hsa_from_file() command. This path is enabled when p_loadKernelFromFile=true. Serialize the code into a global string and thus directly link the hsaco into the executable. This approach avoids the need to find the hsaco file at runtime. This path is enabled when p_loadKernelFromFile=false. A standard ELF container that stores vendor-specific binary code (hsaco). This flavor supports vendor-specific ISA inside a standard container format, and still benefits from the standard HSA runtime API. Effectively this enables use cases where apps and tools can use the HSA Runtime APIs without using HSAIL, and still retain source code portability. 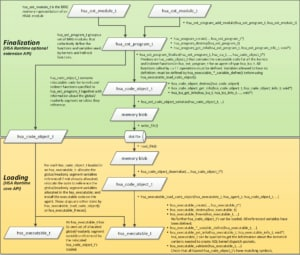 The picture below shows the different steps in the code loading process, and in particular the clean separation between the pre-finalization (green) and post-finalization (yellow) steps. Now that we have an HSA queue we can use the low-level HSA runtime API to enqueue the kernel for execution on the GPU. The code creates an “AQL” packet, uses the hsa runtime APIs (such as hsa_queue_store_write_index_relaxed) to place the packet into the queue and make it visible to the GPU for execution. More details in the code. This capability is a quite useful since we can now mix HCC kernels (submitted with parallel_for_each) with kernels in hsaco format (from OpenCL kernels, or assembly, or other sources) in the same application or even in the same queue. For example, libraries can benefit from this architecture : the library interface can be based on HCC structures (accelerator, accelerator_view, completion_future) while the implementation uses HSA Runtime and hsacos. Our application is still responsible for ensuring that the data at this pointer is valid on the accelerator, before calling the kernel. In this case, the application copies from host data (allocated with malloc) to the inputArray. We do not recommended usinge hc::array_view<> with the direct hsaco code launching techniques we are discussing here. hc::array_view<> is designed to automatically synchronize the data before and after parallel_for_each blocks are launched. Direct launching with HSA runtime APIs will not automatically synchronize hc::array_view<> . void* get_hsa_kernarg_region() // Memory for kernel arguments. This example uses get_hsa_kernarg_region() to allocate memory for the kernel arguments passed to the BitonicSort kernel. Kernarg memory is typically written by the host CPU and read by the accelerator executing the kernel. The example defines a host-side structure to describe the layout of the arguments expected by the kernel, and then typecasts the pointer returned by the kernarg pointer. 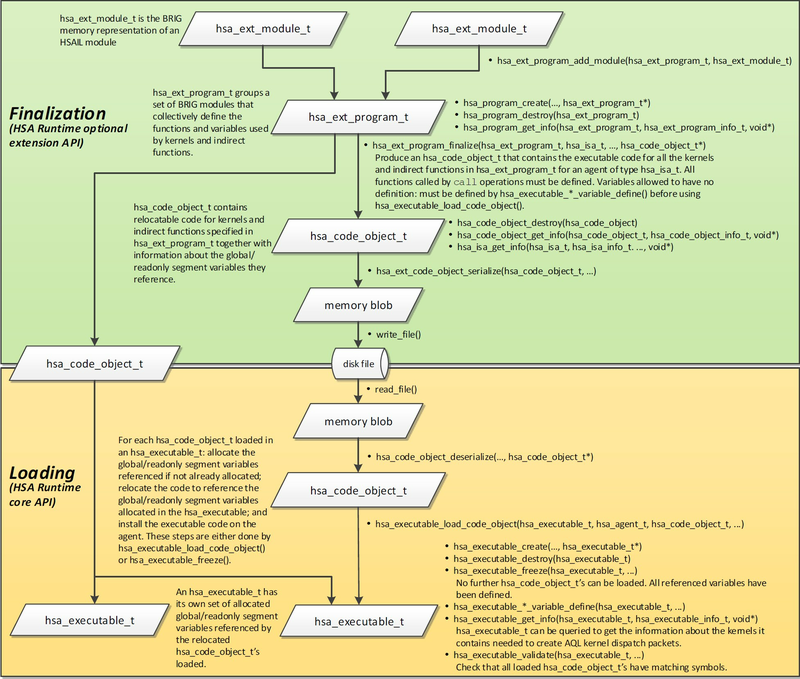 * This is the host-side representation of the kernel arguments expected by the BitonicSort kernel. * Allocate the kernel argument buffer from the correct region. We learned how to use offline compilation to convert an OpenCL kernel into a standard hsaco file and then employed the HSA Runtime API to launch that kernel from an HCC program. Harmony! In the future we’ll look at how to optimize the HSA Runtime calls, and also how to use other tools to create hsaco files (such as the AMDGCN assembler). Stay tuned. As such, OpenCL kernels can be reused under the ROCm platform. However, if an OpenCL runtime over ROCm would be available OpenCL applications could be reused without any source code modifications. Under conditions they could even be binary compatible. Hi Elias- yes, this is something we are evaluating. Really both capabilities are useful. And part of what I wanted to show here was how to use the hsa runtime to launch a kernel written in ANY language – in the near future we’ll look at how to use this same flow to launch a kernel written in GCN ISA assembly. ROCM supports Fiji and Carrizo ASICs. We are working on expanded support for more ASICs but at this time don’t expect to be able to cover Southern Islands like in the 280X. We are evaluating support for Tonga based GPU, 280x, 285x W7100, S7150 S7150x2 boards would be in this family of ASIC. Right now the soonest we can add this support would sometime late Q3. We are testing Hawaii, Elsmere is in the development labs right now these are slated to come out over next two months. Hi, the code here https://github.com/RadeonOpenCompute/HCC-Example-Application/blob/master/BitonicSort-CL-from-HCC/BitonicSort_hcc.cpp uses sizeof(BitonicSort_args_t).